Note: Using the On-demand video-based training is the fastest and easiest way to become a certified Compass Facilitator. Purchase the Facilitator Guide(s) for the study you (& your spouse) plan to lead. Click here to see the Small Group Studies that Compass offers. Read or listen to the “Your Money Counts” book. It is free (hardcopy) with the purchase of a Facilitator’s Guide. “Your Money Counts” is also available as an audio download (MP3) & as an audio book on CD. 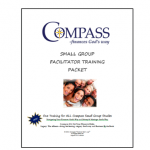 Download & print the Small Group Facilitator Training Packet in its entirety. NOTE: This Training Packet is used for both the Web-based and On-site trainings. CLICK HERE to download the Facilitator Training Packet. Read pages 2-14 in the Facilitator Training Packet. Note any questions you would like addressed during the training. An additional Q&A session will also be held near the end of the training. Complete the pre-work on pages 15-25, including the memory verses and practical applications. Please write your answers in complete thoughts as you will be asked to share what you have written. Please note: If attending the Web-Based training, please plan to arrive at least 15 minutes in advance to install the GoTo Training software and confirm a good audio connection. Web Trainings start promptly. Late arrivals will be asked to join a future training. Two facilitators are recommended for each class (a married couple counts as one facilitator). Spouses are encouraged to attend. If your spouse will be attending, they will also need to have completed all of the pre-training requirements.